Reverse: [hand with pointing index finger] [I . AM .] GOOD . COPPER . [geometric designs] / 37 . Weight: 139.8 grains (9.06 grams) Diameter: 28.3 mm. Comments: This is an example of Crosby's type 3, illustrated on plate VIII as Crosby 21; Hodder calls this die combination 3-B and assigns it the number Hodder 4. 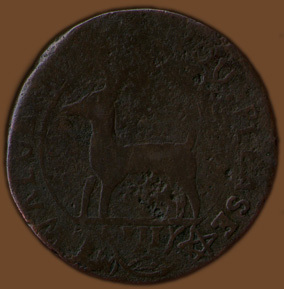 Based on the most recent discussion of the series by Dan Freidus the obverse of this example is identified as die 3.1. Variety 3 is distinguished by the Deer with the legend "VALUE ME AS YOU PLEASE." The only related type is variety 2 which uses "VALVE". These two varieties can also be distinguished by the star after the legend. In variety 2 one tip on the star points toward the deer's hind legs while the next tip to the right points toward the rim; on variety 3 one tip points toward the deer's hind legs but the next tip to the right points toward the center section of the letter E. Within variety 3 there are three dies, of which this example can be distinguished as die 3.1. In 3.1 the L in PLEASE is noticeably lower than the P, while it is at the same height in the other varieties. Also, in die 3.1 the deer stands on a single broad base line, while the other varieties have a double line. Related to this, in 3.1 none of the roman numerals touch the line while some touch the line in the 3.2 and 3.3 dies. The reverse is type B which is distinguished by the three crowned hammers with the legend "I AM GOOD COPPER / 1737". Freidus has distinguished two reverse dies in type B of which B.a was joined with the various obverse 3 dies and reverse die B.b was joined with obverse dies 1.2 and 2. This example is reverse die B.a which can be distinguished even on this well worn example. In die B.a the letters CO and PP in "COPPER" are closer together, with wider spacing between the O and the P, whereas in B.b there is a more even spacing between each of these letters. 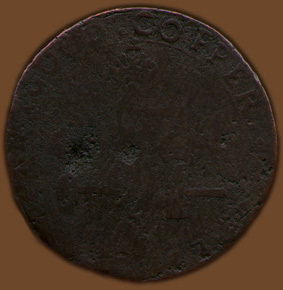 All Higley coppers are quite rare, Freidus lists only eight surviving examples of this die combination. Our specimen appears to have a double "V" in "VALUE". Note that the hand with the pointing index finger is positioned lower than in the other examples of Die 3.1 found in the bibliography to the introductoin; those examples show the fist of the hand much closer to the front leg of the deer. Also, the vine stem below the Roman numeral "III" appears to be broken near the far left point on the star. Obverse: [hand with pointing index finger] THE . VALVE . OF . THREE . PENCE . 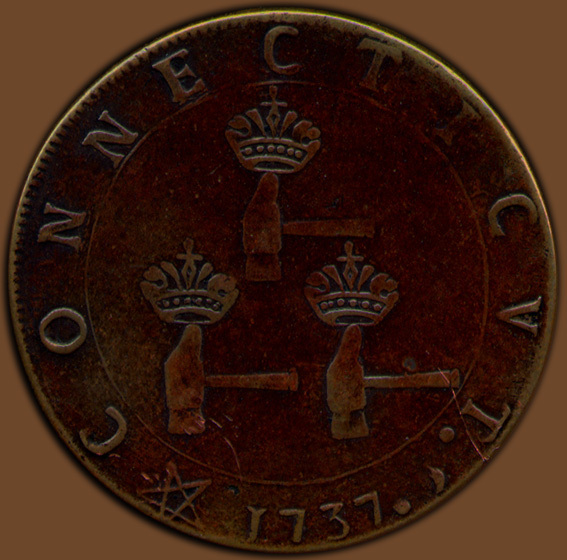 Reverse: [five pointed star] CONNECTICVT . [geometric half moon shape] / 1737 . Weight: 152.0 grains (9.84 grams) Diameter: 28.3 mm. 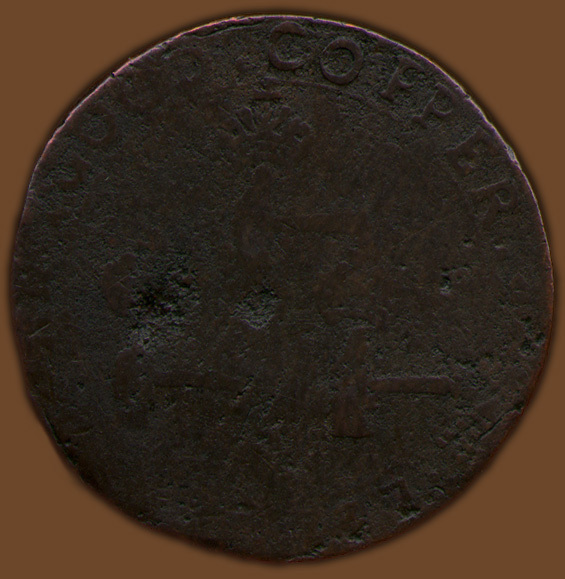 Comments: This is a copper reproduction of the first Higley variety, namely obverse type 1 with reverse A. 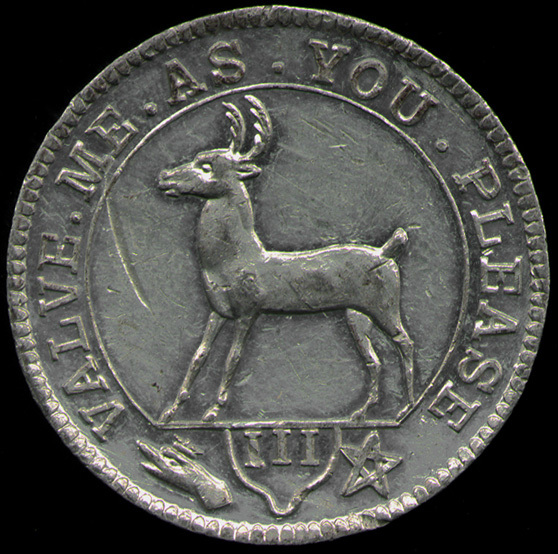 The reproduction is easily distinguished from the originals by their much better condition and because on the obverse of the reproduction Bolen included a raised dot in the lower portion of the open bow of the C in the word "PENCE" and on the reverse he added six dots to each crown while originals have only five dots. The obverse is not an exact copy of any of the three dies of type 1. Like die 1.3 the double ground line points to the center of the H in "THE" and touches the C in "PENCE" but the two E's of "THREE" touch the line which only occurs on die 1.2! The reverse imitates the single variety of die A.
John Bolen of Springfield, Massachusetts created these dies in 1864 and minted 40 examples in copper and 2 in silver. Later Bolen sold the dies to F.S. Edwards who struck additional examples in nickel and others in brass. Weight: 119.1 grains (7.71 grams) Diameter: 26.6 mm. Comments: Although more commonly known by the Rulau and Miller storecard token numbers, this is also listed in Kenny as Robinson 1. The obverse is based on the type 2 Higley with "VALVE" although it is not a close copy. 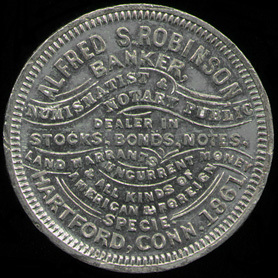 According to Robinson's price list, reproduced in Kenny, 20 examples were produced in silver and 150 examples were produced in each of the following metals: brass, copper, nickel, plated and in tin. 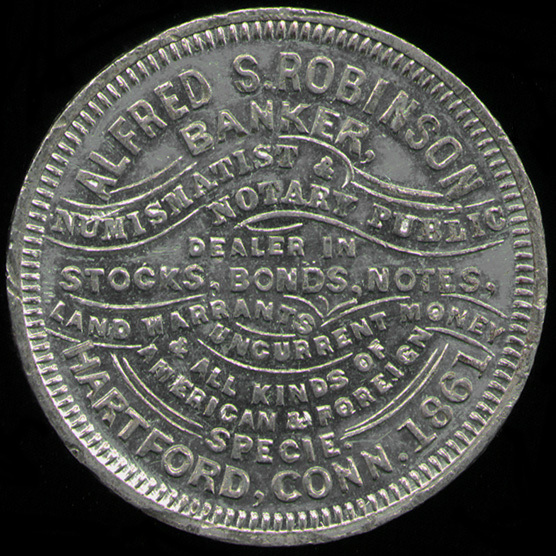 Robinson called this storecard the Granby copy after the city where the original coppers were produced. 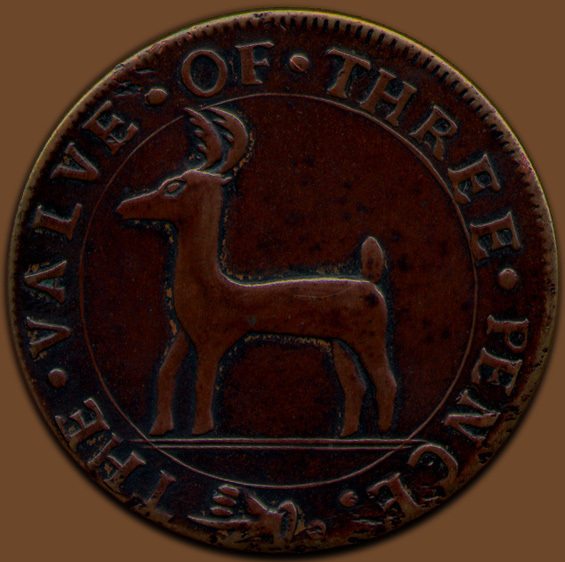 Provenance: Part of a 1,100 item collection of nineteenth century tokens contributed by an anonymous donor. Pine Tree Coinage: p.2 Section Contents Sommer Islands "Hogge Money"